The financial ramifications of a divorce can be devastating. But with proper planning and expert help from professionals specializing in financially equitable divorce settlements, you can increase your chances of arriving at a settlement that fully addresses your long-term financial needs -- and your spouses too. What's missing in most divorce processes is financial expertise. A Certified Divorce Financial Analyst™ can forecast the long-term effects of the settlement. By using a Certified Divorce Financial Analyst™, both partners have a clearer view of their financial futures. Only then can they approach a settlement that fully addresses the financial needs and capabilities of each. To learn more about how a Certified Divorce Financial Analyst™ can help you plot your financial future with Divorce Plan software, read the case example "click here". CDFA™’s are trained to advocate for men and women.The CDFA™ simply interprets the numbers and helps the attorney build a strong case that’s in the client’s best interest. Many CDFA™’s are also trained mediators and often times take a role in facilitative mediation and collaborative law. 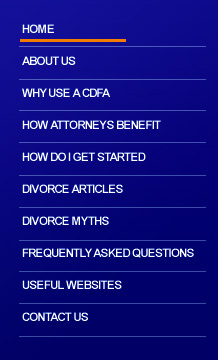 However, CDFA™’s are not attorneys and cannot give out legal advice. The IDFA™ always recommends that any person going through a divorce receive independent legal advice.